Medium size and texture, set well apart. Carried erect or semierect and sensitive in use. HAIR: Two varieties: Moderately long or Smooth. In both, topcoat dense and medium textured, undercoat soft and dense giving good weather resistance. In the moderately long-coated variety, abundant coat forms mane, breeching and brush. 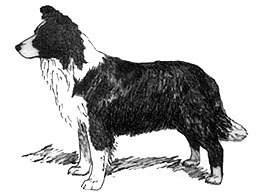 On face, ears, forelegs (except for feather), hindlegs from hock to ground, hair should be short and smooth.